EDINBURGH – Scotland’s bid to secure its own tax setting powers has hit a new stumbling block as the latest analysis shows that its revenue forecasts are lower than previously expected. 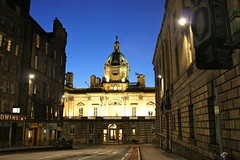 At a meting of the Finance Committee of the Scottish parliament, the chairman of the Office for Budgetary Responsibility Robert Chote unveiled new tax revenue forecasts which showed that in 2016, the first year that Scotland may independently set a portion of its income tax rate, tax receipts will be lower than originally expected. The OBR’s revenue forecast has been reduced by GBP 657 million, falling to a total of GBP 4.9 billion for the 2016 fiscal year. He added that while Scotland is now seeing its lowest unemployment rate in four years, there has not yet been a corresponding boost in economic productivity. In 2016 the UK government will reduce all of the rates of income taxes in Scotland by 10 percent, and will allow the parliament of Scotland to set its own additional tax rate of up to 10 percent. The OBR’s original forecasts, which was prepared 12 months ago, were based on the presumption that the additional tax rate would be set by parliament at the maximum 10 percent. Photo by Kyle Taylor, Dream It. Do It.